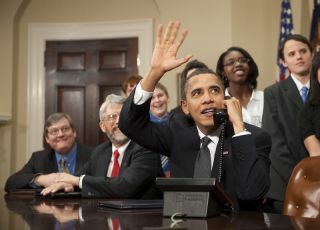 U.S. President Barack Obama, accompanied by members of Congress and middle school children, waves as he talks on the phone from the Roosevelt Room of the White House to astronauts on the International Space Station, Wednesday, Feb. 17, 2010 in Washington. This story was updated at 3:57 p.m. ET. CAPE CANAVERAL, Fla. - President Barack Obama unveiled a sweeping new space vision for NASA and the United States Thursday, one that aims to send astronauts to a nearby asteroid and ultimately on to Mars in the mid-2030s. Speaking to a crowd of more than 200 that included scientists, astronauts and policy makers here at NASA's Kennedy Space Center, President Obama outlined his plan for NASA's future space exploration. That plan includes resurrecting a pared down version of the capsule-based Orion spacecraft initially slated to be scrapped under the president's cancellation of the Constellation program in February. By 2025, the United States should be ready to test manned spaceships for deep space exploration, vehicles capable of exploring beyond the moon on the first-ever manned trip to an asteroid, Obama said. "By the mid-2030s I believe we can send humans to orbit Mars and return them safely to Earth," President Obama said. "And a landing on Mars will follow, and I expect to be around to see it!" "I think this president gets it," NASA chief Charles Bolden told the crowd after the president's speech. Bolden called on the group to bring new ideas to a series of follow-up discussions on the future of the International Space Station, solar system exploration and fundamental technology research. "This is not for show," Bolden said. "We want your ideas. We want your thoughts." The president also announced his commitment Thursday to building a heavy-lift rocket in 2015, one which could be geared to launching new spacecraft and payloads for ambitious expeditions to a nearby asteroid and stable points in space called Lagrange points in preparation for a manned spaceflight to Mars. Obama has proposed a $19 billion budget for NASA in 2011, and added another $6 billion over five years onto that in his announcement today. "We will finalize a rocket design no later than 2015 and then begin to build it," Obama said. "I want everyone to understand. That's at least two years earlier than was previously planned. " NASA's original Constellation program aimed at retiring the space shuttle fleet in late 2010 and replacing it with Orion spacecraft and Ares rockets by 2015. The plan, announced in 2004 by then-president George W. Bush, sought to return astronauts to the moon by 2020. But an independent review by a White House committee found the program behind schedule and underfunded to accomplish its end-goal of returning astronauts to the moon by 2020. "I understand that some believe we should attempt a return to the surface of the Moon first, as previously planned," Obama told the invitation-only audience. "But I just have to say pretty bluntly here. We?ve been there before...there?s a lot more of space to explore, and a lot more to learn when we do. So I believe it?s more important to ramp up our capabilities to reach and operate at a series of increasingly demanding targets while advancing our technological capabilities with each step forward. And that?s what this strategy does. And that?s how we will ensure that our leadership in space is even stronger in this new century than it was in the last." Edward Crawley, an MIT professor who served on the White House committee, said Obama?s plan falls in line with one of the committee?s recommendations ? a flexible plan that allows for incrementally more ambitious deep space missions by astronauts using a new heavy-lift rocket. "This is essentially ? the flexible path," Crawley told reporters before Obama's speech. Obama unveiled his space plan at the Operations and Checkout Building at the Kennedy Space Center, the very same building NASA turned over to the Constellation program in 2009 to build and service Orion spacecraft. This is the first time in 12 years a sitting U.S. president has visited the Florida spaceport. The last Commander in Chief to visit the NASA spaceport was President Bill Clinton, who went to watch original Mercury astronaut John Glenn rocket into space aboard the shuttle Discovery at age 77. "For me, the space program has always captured an essential part of what it means to be American ? reaching for new heights, stretching beyond what previously did not seem possible," Obama said. "And so, as President, I believe that space exploration is not a luxury or an afterthought in America?s quest for a brighter future. It is an essential part of that quest." Obama?s proposal to cancel the Constellation program and call on commercial spacecraft builders to provide the spaceships to launch astronauts into space has drawn harsh criticism from lawmakers and the public alike. Most recently, famed Apollo 11 astronaut Neil Armstrong ? the first person to walk on the moon ? and other lunar explorers spoke out against the plan in an e-mail statement sent to the media. Armstrong and fellow Apollo program astronauts Jim Lovell and Eugene Cernan called Obama's space vision "devastating" to the United States' spaceflight legacy. "To be without carriage to low Earth orbit and with no human exploration capability to go beyond Earth orbit for an indeterminate time into the future, destines our nation to become one of second- or even third-rate stature," the former astronauts wrote. Other critics blasted the plan because of its initial apparent lack of destination, while supporters contend that it will free NASA to tackle more ambitious space missions by using commercial vehicles to ferry American astronauts to low-Earth orbit. Those supporters include Buzz Aldrin, who landed on the moon with Armstrong during the 1969 Apollo 11 mission. "I hope NASA will embrace this new direction as much as I do, and help us all continue to use space exploration to drive prosperity and innovation right here on Earth," Aldrin said in a statement. "Mars is the next frontier for humankind, and NASA will be leading the way there if we aggressively support the President?s plans." NASA already has contracts in place with two American companies to provide unmanned cargo delivery services to supply the International Space Station once the shuttle fleet retires. Those companies ? the California-based Space Exploration Technologies (SpaceX) and Orbital Sciences in Virginia ? plan to begin testing their respective rockets and spacecraft over the next year. Before arriving for his speech, Obama met with SpaceX founder Elon Musk at the nearby Cape Canaveral Air Force Station, where SpaceX is readying its new Falcon 9 rocket and prototype Dragon spacecraft for a May 8 launch debut. "Handing over Earth orbit transport to American commercial companies, overseen of course by NASA and the FAA, will free up the NASA resources necessary to develop interplanetary transport technologies," Musk said in a statement. "This is critically important if we are to reach Mars, the next giant leap in human exploration of the universe." White House science advisor John Holdren said Obama's new space plan will boost the number of human spaceflights, and the number of destinations for space exploration ? manned and unmanned ? across the solar system between now and 2020. Obama's space plan, which still needs to win approval from a skeptical Congress, still includes retiring NASA's shuttle fleet, but adds some funding to allow flights between September and December 2010 if there are slight delays. It would also extend the International Space Station's operations through at least 2020. "It will expand the roster of deep space destinations that humans will explore after 2020," Holdren said. NASA plans to fly just four more shuttle missions ? one of which is under way now ? before retiring the shuttle fleet later this year. The space shuttle Discovery is in space today. The shuttle and a crew of seven astronauts are in the midst of a two-week delivery mission to the International Space Station. Discovery is due to depart the space station on Saturday and land Monday morning. Here at the Kennedy Space Center, workers are focused on the 2,500 jobs beyond what was coming for the planned Constellation program ? also promised in Obama?s space plan. The center expected to lose thousands of jobs with the shuttle retirement in September and the cancellation of Constellation. Some 10,000 jobs are expected to be created across the country as a result of commercial spacecraft development, the president said. Obama also said he is proposing a $40 million initiative to support Florida's regional economic development. The program would be aimed at preparing the local workforce for the coming shuttle fleet retirement to help find new jobs. "I am 100 percent committed to NASA and its future because broadening our capabilities in space will continue to serve our society," Obama said.